I set out to make peanut butter bread. You can call it ‘bread’ if it makes you feel better. It’s really more like peanut butter cake baked in a loaf pan. But let’s go with bread. Sounds healthier. The interior is soft, springy, fluffy, with an open crumb. It’s not overly peanut buttery and reminds me of yellow butter cake, minus any butter used in the recipe. 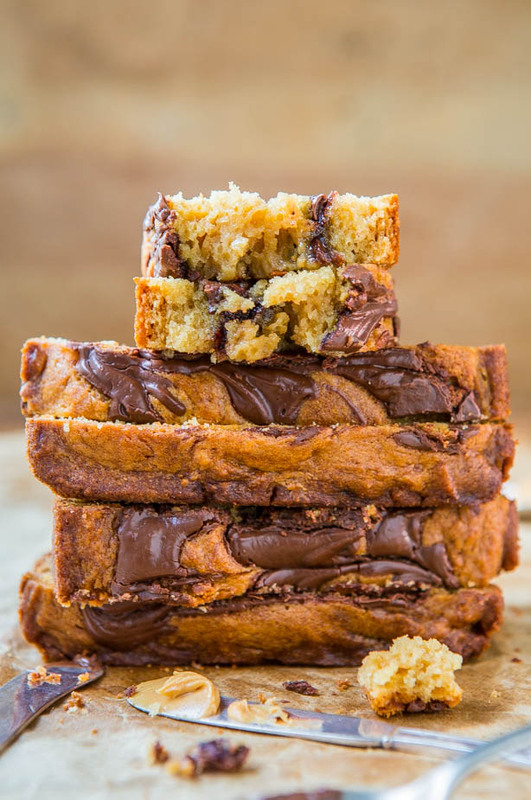 And there’s a layer of Nutella in the middle of the bread, and more Nutella that’s swirled on top. Anytime I combine peanut butter and Nutella, I’m very happy, and this bread made me jump for joy. It’s an easy quickbread batter that’s whisked together in one bowl without needing to use a mixer. It’s so easy that the first 7 ingredients including buttermilk, coconut oil, and peanut butter are all just added together, before folding in the dry ingredients. Buttermilk helps keep breads and cakes soft, springy, bouncy, tender, with the perfect balance of density and fluffiness. The results are unparalleled. You can make buttermilk by souring your own milk. Add about 2 tablespoons vinegar or lemon juice to 1 cup milk, wait for 10 minutes for it to curdle, then use as indicated. I used Nutiva Coconut Oil from iHerb.com. Code AVE630 at checkout saves you $10 off your order. I love iHerb for everything like probiotics, bulk cinnamon, pumpkin pie spice, liquid vanilla stevia drops, bulk white stevia powder, medicinal fancy-grade honey, chia seeds, face cleanser, and nutritional yeast. 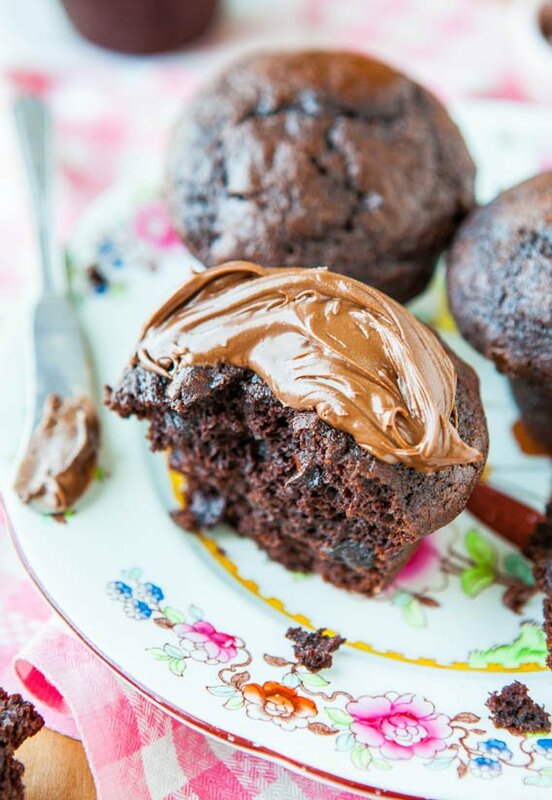 I’m no stranger to using coconut oil in muffins, cakes, bread, cookies and I noticed zero coconut flavor in the cake. 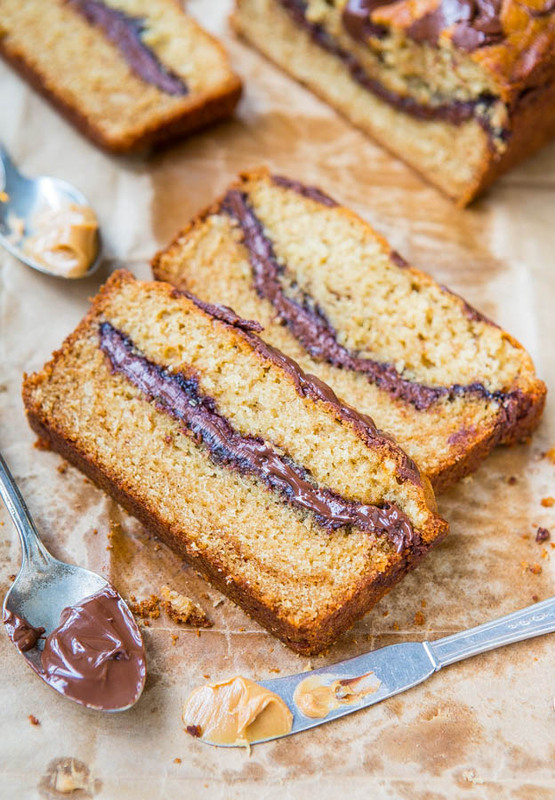 Between the peanut butter and Nutella, any coconut flavor is totally masked, but use another oil if you’re more comfortable. In conjunction with the the buttermilk and coconut oil, the peanut butter helps keep the bread moist and soft, without being overpowering. After the batter comes together, turn about two-thirds of it out into the pan, and top it with about 2/3 cup Nutella in an even, smooth layer. One tip that really helps make this easier is microwaving the jar of Nutella for about 15 seconds, or as needed, so that it loosens up. This makes pouring and spreading it on top of squishy raw cake batter so much easier. 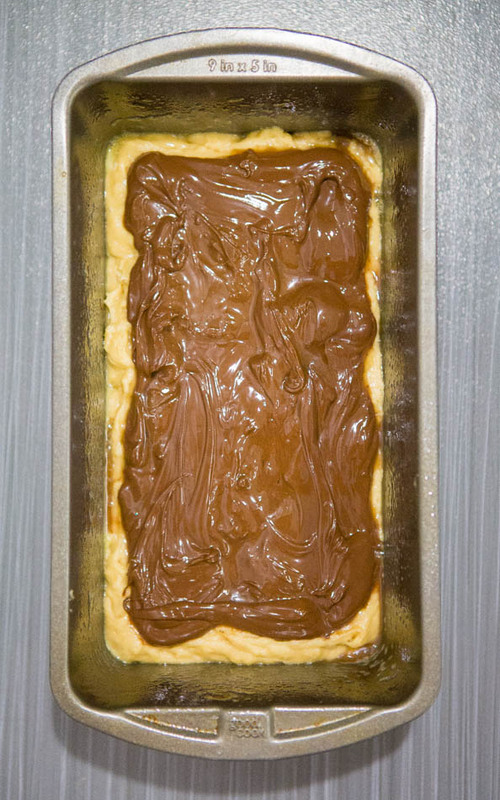 Top with the remaining batter and add more Nutella for swirls. 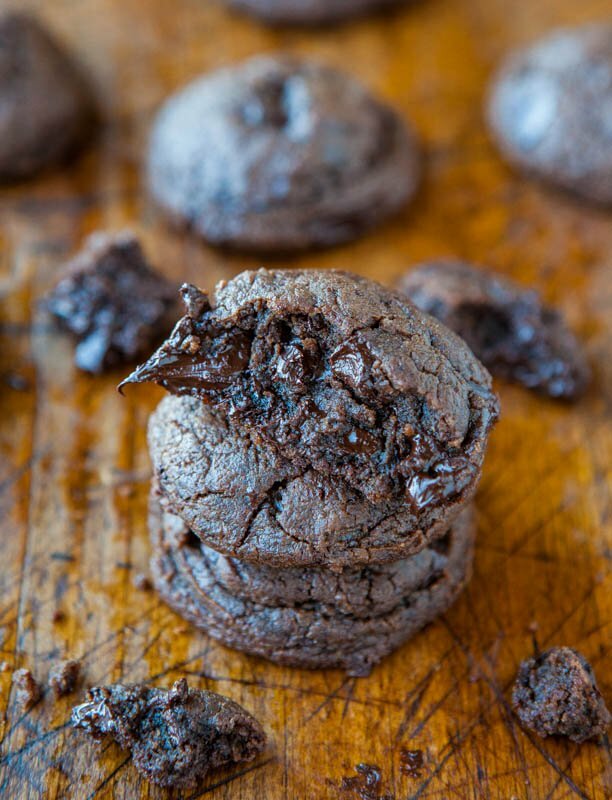 More is usually better when it comes to chocolate and Nutella, but don’t add more than about 1/4 cup, and make sure there aren’t any large, concentrated blobs. Blobs are heavy, dense, and could cause the top of the loaf to fall or sink as it cools. I had a couple iffy patches because I got a bit carried away with my swirling. It sure tastes great, but visually-speaking, sunken patches don’t win blue ribbons. To make the swirly pattern I did, I started with 3 long train tracks. Then I took a toothpick perpendicular to the tracks, traversing the length of the pan, until it was swirled. Do whatever is easiest for you. The top is like the most perfect tasting muffin top. 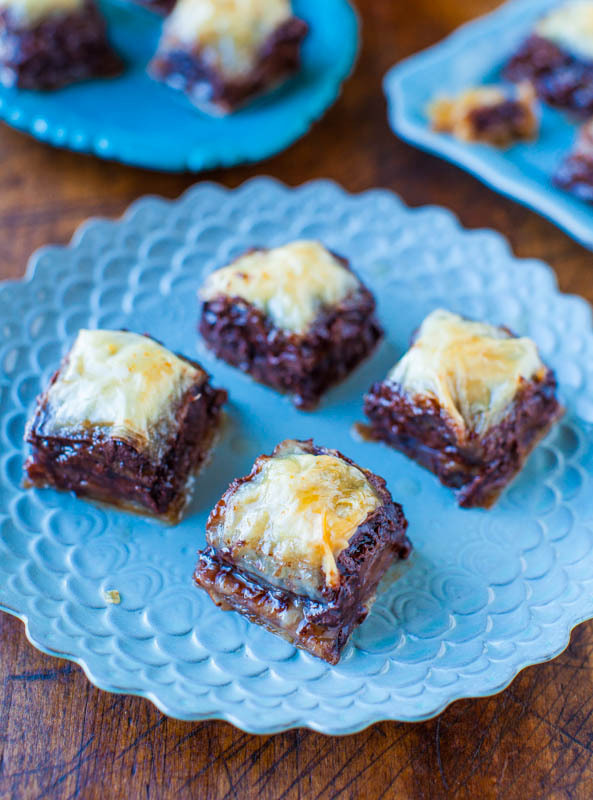 Shiny and dense, but with big chocolate Nutella rivers winding over it. And there’s the soft, buttery interior, with Nutella bisecting it. It’s like a layer cake, without any of the work. If we hadn’t scarfed this loaf in under 2 days, I have a feeling it would make excellent French toast, but it disappeared before I could try that. 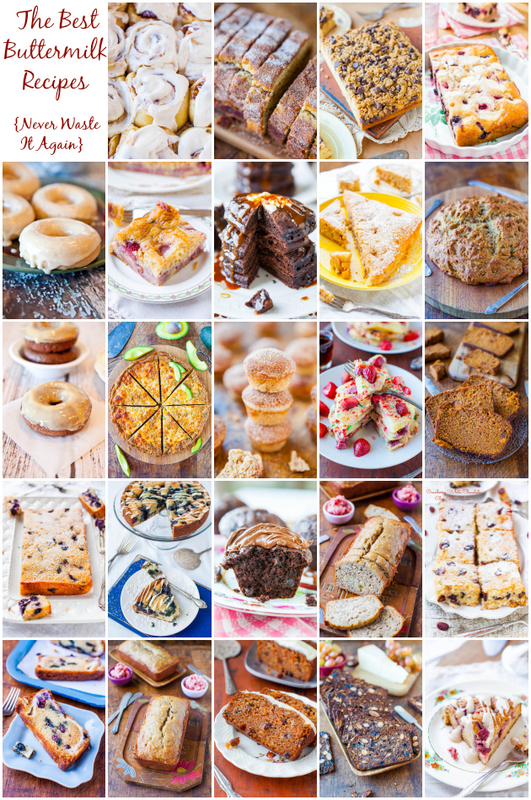 This is my idea of ‘bread’, for sure. And since it’s bread, seconds (and thirds) are totally okay. 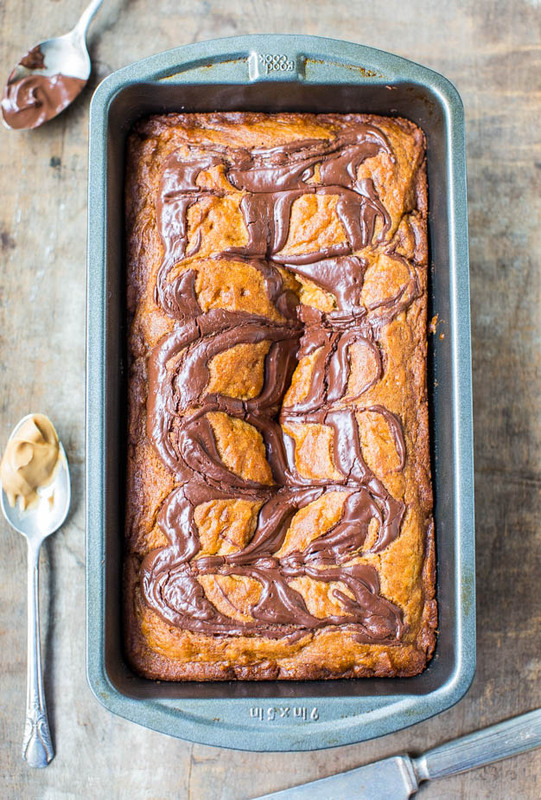 This ‘bread’ is really more like peanut butter cake baked in a loaf pan, but bread sounds healthier. The batter comes together in one bowl, without needing to use a mixer. 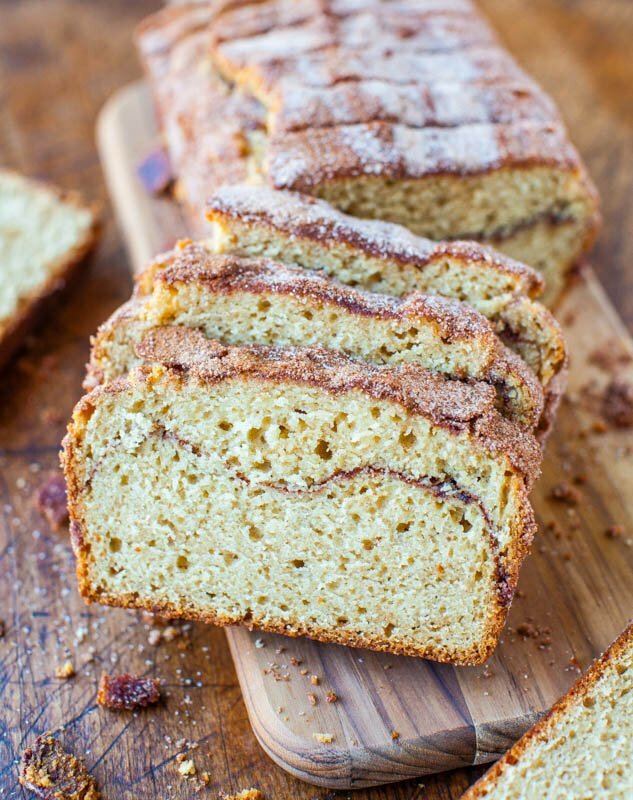 Buttermilk, coconut oil, and peanut butter all help keep it very soft and moist. The interior is soft, springy, fluffy, with an open crumb. It’s not overly sweet nor overly peanut buttery, and reminds me of yellow butter cake, minus any butter used in the recipe. 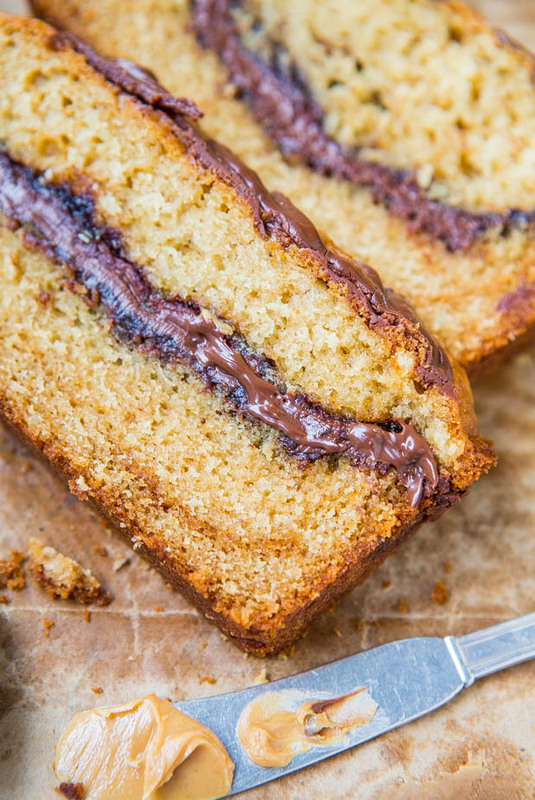 There’s a layer of Nutella in the middle of the bread, and more that’s swirled on top. Nutella and peanut butter are a wonderful pairing. 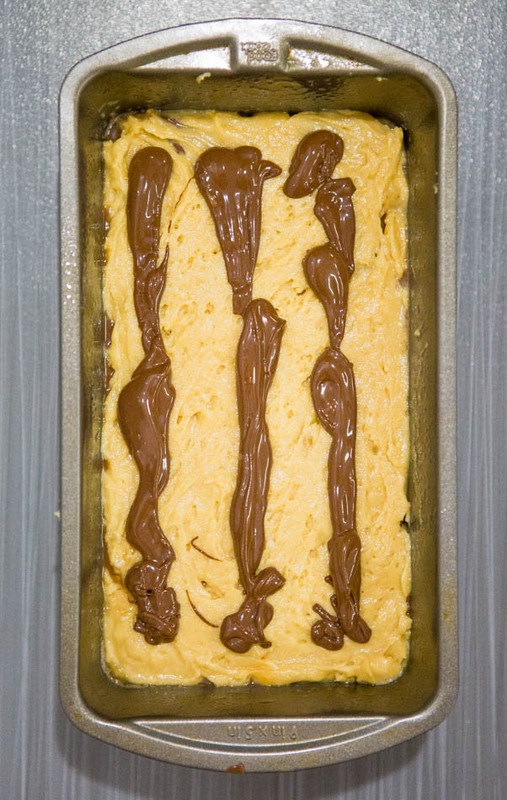 Make sure when adding the Nutella top swirls that there aren’t any large, concentrated blobs because they could cause the top to fall upon cooling. In a large bowl, whisk together the first 7 ingredients, through vanilla. Add the flour, baking soda, optional salt, and stir until just combined; don’t overmix. Batter will be very thick and lumpy. Don’t try to stir the lumps smooth. Turn about 2/3 of the batter out into prepared pan (just eyeball it), smoothing the surface lightly with a spatula; set aside remaining batter. Evenly pour about 2/3 cup Nutella over the batter (just eyeball it), smoothing it lightly with a spatula to push it into the corners and cover the surface completely. 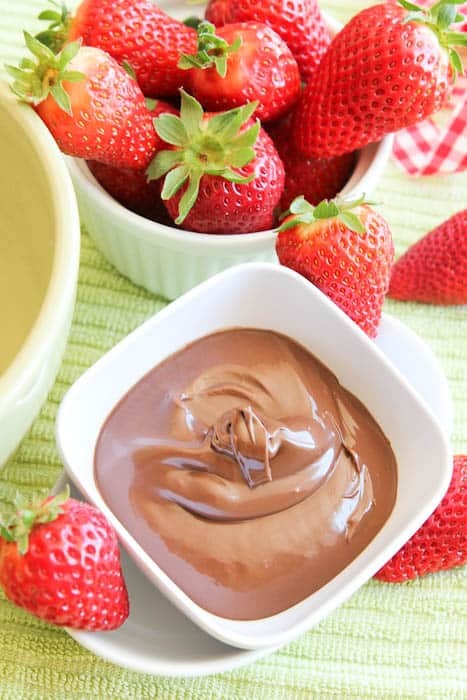 Tip: Microwaving the jar of Nutella for 15 to 30 seconds, or as needed, makes pouring and spreading it easier. Top with the remaining batter, smoothing it lightly with a spatula. Drizzle about 1/4 cup Nutella (just eyeball it) over the top for swirls. Make sure there aren’t any large, concentrated blobs because they could cause the top to fall upon cooling. To create the marbled pattern shown, I made 3 long, parallel lines, like train tracks. Then with a toothpick, I went up-and-back horizontally (perpendicular to the train tracks), covering the length of the pan until it was completely swirled. Make swirls in whatever way is easiest for you. Bake for 40 to 45minutes (I baked 42), or until top is set and firm, and a toothpick inserted in the center comes out clean, or with a few moist crumbs, but no batter. Allow bread to cool in pan for at least 30 minutes before turning out onto a wire rack to cool completely. Note that bread may fall a bit in the center as it cools. This is to be expected because it’s very weighed-down with Nutella. Bread will keep airtight at room temperature for up to 5 days, or may be frozen for up to 6 months. Serve plain, with a smear of peanut butter and/or Nutella, makes wonderful French toast. 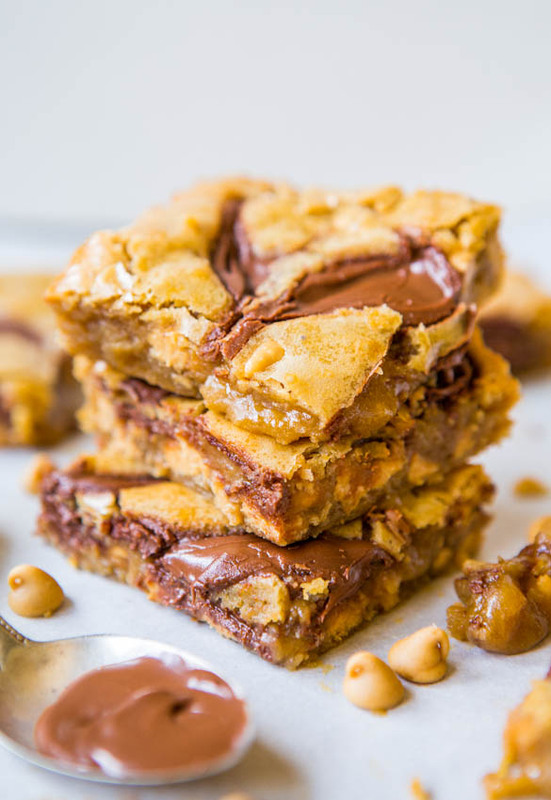 What’s your favorite peanut butter + Nutella recipe? I seriously need this bread in my life!! 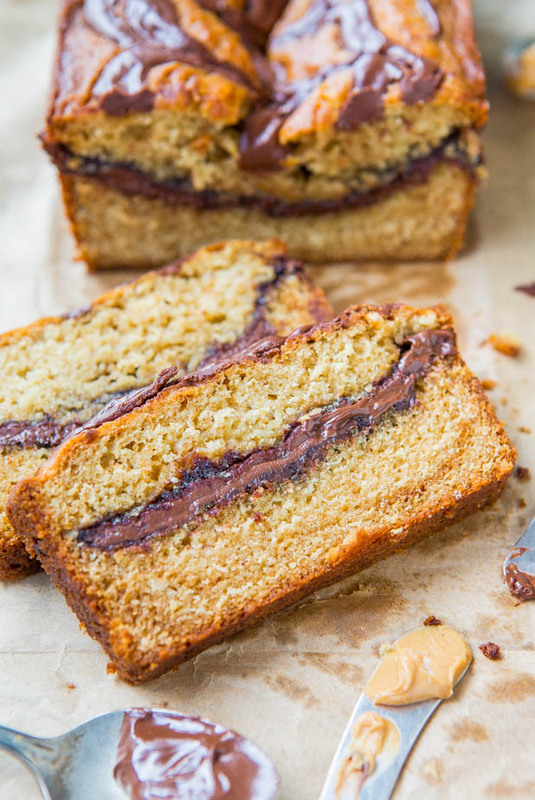 Yes, peanut butter bread is always a winner. 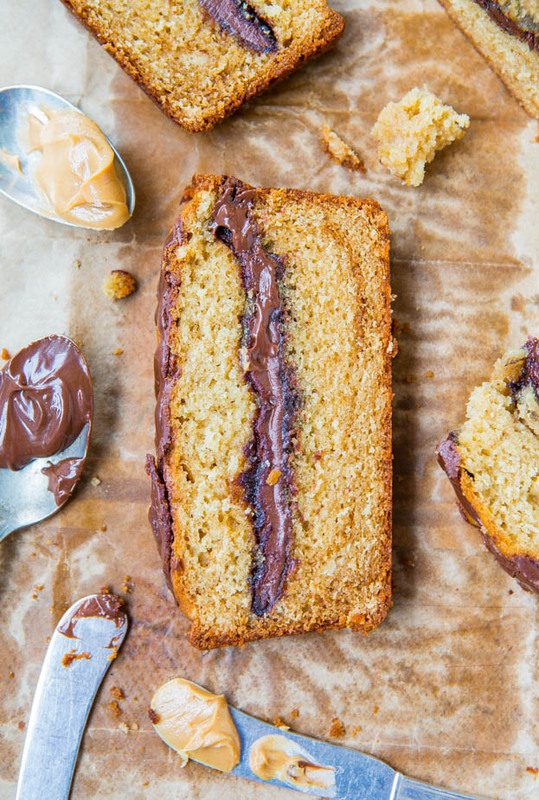 And layer cake without the work – love it! My lonely cup of coffee is practically begging me to make this! Gorgeous swirling work!! Thank you again for yet another delicious and easy to make recipe! I made this bread yesterday to try, and now I plan on making a couple more loaves to give out for the holidays. It is a big hit with my family! Your recipes are the best. Glad you loved it & thanks for the compliments about my recipes in general! That is so nice to hear! 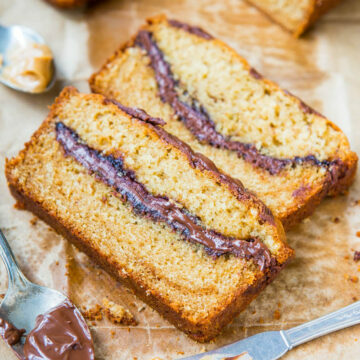 Hi Averie :) ive been looking for a good peanut butter cake recipe for ages but havent been able to find one thats moist and peanut buttery enough. Ur recipes are awesome so i really wanna try this, if if i was to make this as a cake, what size tin do u recommend? Thanks! I would say a 9-inch square would be fine. That’s bigger than a 9-inch round, make a mental note of that. The issue is that with the layering you will have very little wiggle room to get just enough batter in the base, then do the filling, then add it to the top so that it all stays neat and distinct. In that sense, a loaf pan is wayyyy more forgiving. Good luck! Yes if you’re new to baking with coconut oil, milk and eggs should be at room temp or there will be ‘frozen’ spots but honestly, even if they happen (within reason), I find that it all works out when baking and in the oven. The oil softens again, disperses, and all is well so I wouldn’t get too worry about that, at least I don’t, but that’s just my thoughts and always do what you think is best. Glad the bread came out great for you! Probably but I personally don’t love crunchy nuts in super soft cake/bread but if that texture won’t throw you, I’m sure it will work fine although I haven’t tried personally. No you can’t make the batter and then freeze it. 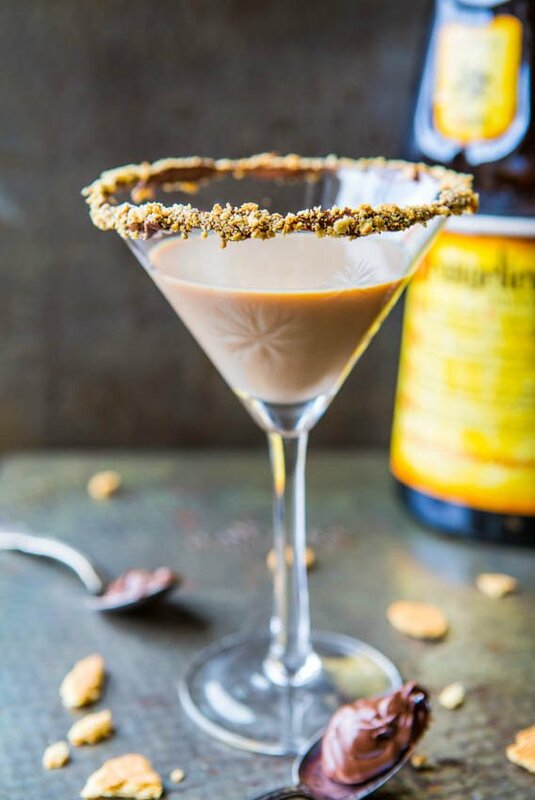 This recipe looks amazing~ Is there a way though to replace the “heaping 1/3 cup creamy peanut butter”? 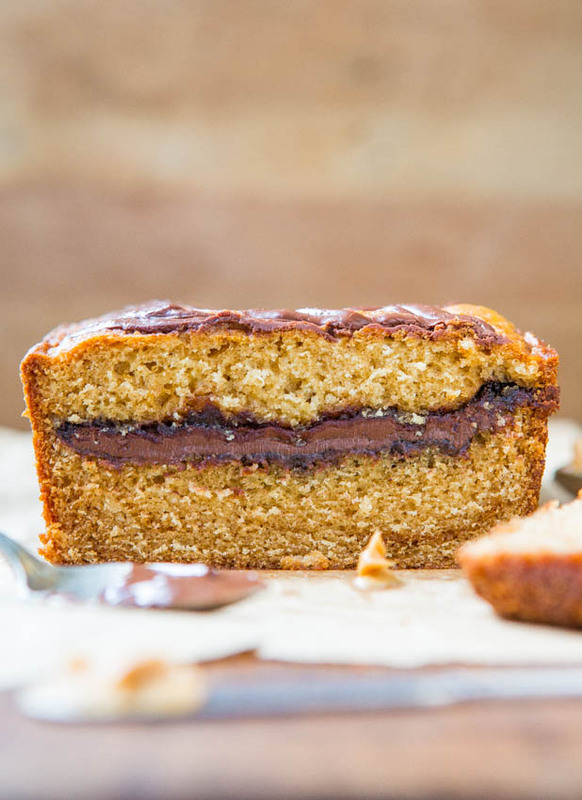 We love Nutella but have a slight allergy to peanut butter, so would prefer to omit that. I can’t make any recommendations because I have only made the recipe is written. You could possibly use 1/4 cup almond butter or sunflower seed butter but because they’re runnier than conventional PB, don’t use the full 1/3+ cup. You could also try omitting and see what happens. Hi is there a substitute for coconut oil.. thank you .looking forward to made your recipe and enjoy the soonest.. i just cant find coconut oil for baking in my place/country. I always find palm oil.im.confused if there are the same. You could use canola or vegetable oil.